Goblin Charbelcher - I was talking to Scott about this card, and I think he is right in his assessment that this card could be a finisher for a goblin deck. It can either wipe out an annoying creature, or you can use it to finish off your opponent. Since Goblin is weenie by nature, it's usually running light on land, so you'll probably reveal a good deal of non-land cards before you hit your mountain, which will double your damage. You can use sac lands in your deck to thin out extra land and really whack them hard. Sounds like fun! In limited, it's not as reliable, but ANY decent removal is worth playing in limited, so you play it no matter what color you're going. Plus, this is REUSABLE removal, which makes it much more amazing! By the way... we could use your help!! We just posted our New Website for Shuffle & Cut Games, and it would be great if some of you could drop in and give it a test run. 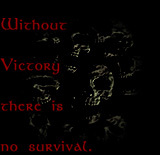 The Strategy and Search features are not active yet, but we're working on them. Please send any bug reports to: ScottAndChris@ShuffleAndCutGames.com. Thanks, everyone!! An interesting concept. Seems like it would only go into a deck with mountains in it, and a deck with a way to stack the deck. That makes me think of one card - Goblin Recruiter. And that deck already has cards that are better than this, so I don't think this will have a place in any serious deck. Still, seems like fun for a casual deck, though. In limited, it's a repeatable deamage source that can hit creatures or players. Erratic Explosion was good in Onslaught block limited, and this will be about as good in Mirrodin block limited. Unfortunately, though, it's colorless, so any color can use it. So I think this will go pretty high in draft, and I wouldn't hesitate to use this in sealed. 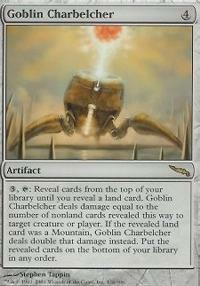 Chapman Goblin Charbelcher is really odd card. Still, there is some real abuse potential to this card in a well designed deck and removal is just good.